Legendary UK bike racer and British Drag Racing Hall of Fame member Brian Johnson died suddenly on 13th April 2015. Brian was particularly renowned as one of the small number of European racers who raced with huge success in the USA. Brian's racing career started in Street Bike on a 750 cc Honda, found drag racing to his liking and quickly moved to Pro Stock Bike, becoming the first European Pro Stock Bike racer to record an eight-second pass in 1981. 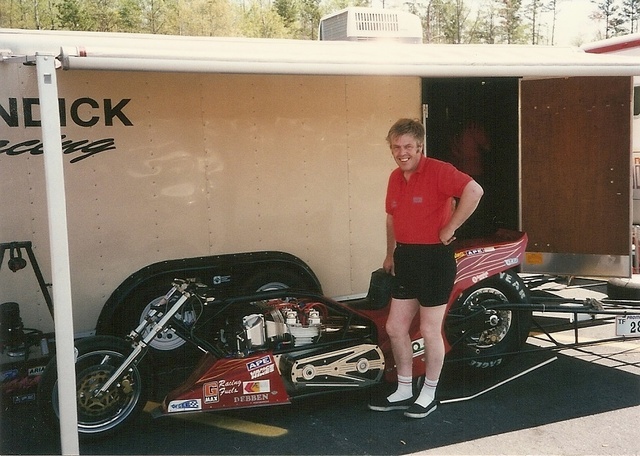 After three PSB Championships Brian moved to Top Fuel Bike on the first of the Imperial Wizard bikes with which he set records and won a Championship in the USA. The second Imperial Wizard was the first TFB outside the USA to run a six-second pass, and in 1991 took the world best of 6.61 seconds. More USA success came in 1999 when he won Top Fuel Bike at the AMA/Prostar World Finals in Gainesville. 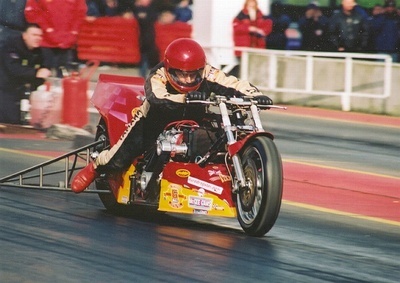 Brian set best marks of 6.101 seconds and 234.11 mph before retiring in 2001 at which point he was presented with keys to Santa Pod Raceway. Brian's engineering skills and innovative spirit were in the finest British tradition. He and his ever-supportive wife Ann were inseparable at the track and away from it. We always found Brian to be friendly and approachable, hospitable, informative, no-nonsense and on occasion very funny; he once famously said of his Top Fuel Bike that "After you've spent the off-season riding a push bike and stroking the cats it's a bit unreal getting back on these things!". We were privileged to sit with Brian and Ann at last year's British Drag Racing Hall of Fame Gala Dinner and the years rolled back. We have received the following tributes to Brian. To send your own tribute, E-Mail tributes@eurodragster.com. On behalf of our whole family, thank you to everyone who has sent tributes with regard to my brother, Brian. The man chose what to he wanted to do, chased a dream and achieved beyond all but his expectations. I don't think he ever set expectations other than to be the very best he could be and knew that he could achieve whatever he set his mind to! Those who really knew Brian were always aware that he was a man of fantastic technical ability, a man with a great sense of humour and an extreme talent in his riding ability. To do what he did for so many years, breaking European time and speed records in Pro Stock then moving up to Top Fuel and moving to the USA, then winning a Championship over there is something that nobody is likely to repeat anytime soon. His single mindedness enabled him to beat the very best and become a genuine legend in motorcycle drag racing. His generosity to others has been well documented within the tributes that have been published but Brian really was a people person. He had a boundless enthusiasm for anything and anybody he was interested in and was always willing to offer advice or assistance to anyone he felt wanted it. This is proven by the comments people around the world have written about him over the past few weeks. Beyond the drag racing, I feel so blessed to have such an amazing big brother that has been such an enormous influence in my life. The fact that he has touched so many people around the world is a source of enormous pride to me an our family. Now we need to try and cope with his loss... he has left an enormous gap in our lives, he is irreplaceable. Brian ‘BJ’ Johnson was clearly an inspiration to so many of us in the drag racing world, and uniquely for him, his achievements will forever testify to the fact he literally was an inspiration the world over. He will be so sadly missed. I vividly remember the day I (rather naively) wrote to him asking for sponsorship for my new Street Bike, only to be greeted with a warm invitation to come and talk at his Johnson Engineering bodyshop in Ascot. He let me down gently - no sponsorship sadly – but from that day on, we built a real friendship, not just with Brian, but with Ann as well. Always welcoming and happy, they were fantastic hosts and forever generous with the things they had. We built engines together, we spent time at the house and lock-up garage, we’d spend hours just talking bikes, planning the next ‘mods’ and trips - and laughing – a lot. We ate out together at Brian’s favourite restaurant in Windsor – he always had the same thing ‘Chicken Kiev’ (what was wrong with him?). For years, we pitted next to each other at the Pod, usually with the Pallants next door – and we’ll always remember the trips to Drachten and Mantorp Park Sweden, ‘cramped up’ for the trip in his van. In Pro Stock Bike, he was both a friend and a fierce competitor – I remember his first eight second run – and it wasn’t until he moved on to Top Fuel that I eventually won the PS Bike Championship in ’85 – cheers for that Brian! Great memories that will never fade and I remain in awe of his achievements. Today was difficult enough at Brian’s funeral, but to learn that his devoted wife Ann had also passed away on the morning of his funeral, added to the sadness and loss. Our thoughts and best wishes are with all of Brian and Ann’s family and friends. Having had a couple of weeks to think about a tribute to Brian I still can't quite find the right words. Memories come and go of Brian and myself first meeting when he had his Street Bike Honda and later, as team mates in Pro Stock, at Santa Pod, Drachten and Mantorp Park. My last couple of years in racing were on the Johnson Engineering Kawasaki, sponsored by Brian and Anne. Over 30 years later, I regularly replay flash backs, still fresh in my mind, of those times, of the fun we had and of Brian's zest for the sport he loved. Those years were such an important part of my life and simply would not have happened without Brian and Anne's generosity. Thank you. I was so very sorry to hear this sad news, I am really looking forward to catching up with many of my old drag racing mates that I haven't seen for many years when I visit Santa Pod in July for Dragstalgia, sadly now I won't get see BJ again. I will always remember him as one of the all time greats and keep fond memories of the laughs and jokes we shared so many times in the pits over the years. I know you will be in good company in that great drag strip beyond. My sincerest condolences to Ann and family during this very sad time. We will remember BJ as we knew him, as the larger than life great achiever, legendary racer and all round great guy. Brian was a great ambassador for the sport and was always at the forefront, setting records and standards for others to beat. His fuel bike achievements are and will remain amongst the greatest in the history of the sport. Our thoughts and condolences are with Ann and family. Back in the day, whenever the PA announced that BJ was about to run, everybody in the pits would stop what they were doing and rush to the fence to watch him, such was the star quality of the man. Brian was a great racer, a credit to our sport and a lovely man. I feel blessed to have known Brian and Ann for so many years and my thoughts are with Ann at this very difficult time. "What’s a Johnson?". Few people will get this – but that’s OK. Brian was our friend, on and off track, for a very long period of our lives. The door in Sunningdale would always be open to us, and Brian and Ann visited us in Sweden. Together with Brian and Ann we had some great times in country pubs, having meals that demanded you to put on your "elastics"! Guess food was another shared interest. Brian’s idea of the perfect temperature ice cream was 13 seconds (no more, no less) in the microwave. We miss you Brian "Who". It was fine to know you for such a long time. Brian was a canny racer and great guy, who was very good about explaining things to a nitro numbskull like myself. When he sold his bike to Jimmy Brantley, he invested in some top quality video equipment and shot alongside me at AMA/Prostar races… until he realized there was no money in it. I’m told he then went to work for McLaren and invested in telescopes. I’ve seen some of his astronomy photos and they are astounding. Godspeed BJ, there is still no money in motorcycle drag racing video! On behalf of the British Drag Racing Hall of Fame let me pass our deepest condolences to Ann and family on the recent passing of Brian. To say he was a larger than life character would be an understatement. He will be remembered forever in the pages of our Hall of Fame. His competitive style and skill were only surpassed by the incredible positive influence he had in our sport. His expertise was legendary and he will be remembered as one of the greatest motorcycle drag racers who ever lived, both here and abroad. I was lucky to see Brian in his last and fastest years on track, always running clean, straight and fast. A very focussed and professional team, a good rider, who else could have got away with doing low 6s in those red boots? A true legend has left the pits. RIP BJ, best wishes to his wife, family, team and friends. Brian was responsible for taking me to race in the USA with my Funny Bike and giving endless advice and help when I dipped my toe into Top Fuel Bike. He would take time to call me the new boy and spend hours advising me and keeping me safe in my approach to racing one of these monsters, and those words of advice stick with me today and will be applied to my new bike when we start to test. Riding was only a small part of Brian's genius as having undertaken to make my own engine I had many discussions with him about the best way forward to make the engine live. At the track he and Ann would always call in to see where we were at and both would give us advice to help us move in the right direction. He was a racing icon and an engineering innovator. Very sad news to read yesterday regarding Brian I had the pleasure of many hours talking to him about drag racing and engineering during lunch times at work whilst he was at Mclaren. Please send his wife Ann and family heartfelt condolences at this difficult time from all that knew him. May I just say that whilst I didn't know Brian that well I always found him to be an honest and decent bloke to do business with. He was also without a doubt one of the world's greatest Top Fuel Bike racers of all time. He was awesome in action and it was a shame he had to stop before he ran a five second pass. My condolences to Ann and anyone else affected by his passing. Sad to learn of Brian's passing. He was a funny guy and a right proper Top Fuel motorcycle racer. I had the pleasure of interviewing him on more than one occasion and both he and Ann were a joy to be around. Our sincere condolences to Ann, all his family and friends. We have known Brian for many years and always had great respect for him and his achievements. We lost a great racer and friend. Rest In Peace Brian. Two words sum up 'BJ'. He was Sensational and Inspirational. One of the first UK racers to take his innovation and skills to America and become a Champion on both sides of the Atlantic in Top Fuel Bike. I treasure the friendship we had following Brian's retirement from the track and hold dear the films that he had shot and edited in the USA as he developed a new passion for recording the best of Bike Drag Racing. 'BJ' will be sadly missed for his passionate knowledge of two wheeled drag racing and for always being the gentleman it was a pleasure to spend time with. Rest in peace. RIP Brian thoughts with family and friends . At this sad and untimely death of my uncle, Brian Johnson, I'd just like to say a few words about an amazing man and gentleman. Many years ago as a youngster my parents took me along to see my Uncle Brian at Santa Pod, at the time racing Pro Stock on The Imperial Wizard. I, as most youngsters would be, was very excited about the day ahead and also the fact that I would be allowed in the Pit Lane to get up and close to these amazing machines. I watched in disbelief my uncle and others race, enjoying every minute of an amazing day, which has remained a great memory of mine, these many years later. Only seeing my uncle again over these last couple of years reminded me what a great man he was and true gentleman he remained. He will be truly missed by all, and may his spirit live on in the world of drag racing and his fans. Gone to join the Gods of Thunder. RIP Brian, our thoughts are now with Ann and family. Thinking of you at this sad time. He received the titles of "Quickest man in the world" and " World Champion" not many can say that and all from a little shed in little England, the boy did good. RIP mate. Brian Johnson was arguably the finest and most successful motorcycle drag racer this counry has produced. The Elapsed Time and Terminal Speed marks he set were a really tough act to follow. I was privileged to get to know him whilst writing the story of his racing career which was subsequently published on the Acceleration Archive. Despite his massive success he was a modest and very down to earth person and an absolute pleasure to be with. My sincere condolences to Ann and Brian's family and friends. Two great legends meet again. RIP Brian. We send our condolences to the family. At the beginning of my Top Fuel Bike career BJ and I had a sort of love / hate relationship. I was the new boy on the block, wet behind the ears, he the old stager, been there, done that and all. He was full of wise words for this rookie, I thought he was full of something else particularly after my very first run against him where he told me "Remember to stay in my lane" just before switching into mine at the top end. However, in time we both became closer as our aims were one and the same, to excel in the class we both loved with a passion. He was selfless in his endeavour, we all know the stories of how he and his wife Ann gave up so much for his chosen sport, but one event struck me that illustrated his focus. After drawing me in the final at a Santa Pod event he 'pretended' to be unable to start his bike after I had put him in the unfavoured left hand lane. He knew that his best chance of running his first five second pass (and what would have been the first outside the USA) lay in running the right hand lane. Despite waiting for him to find the issue he waved at me furiously to start up and take the solo win. Mysteriously as soon as I had run down the track to take the event win he found the source of the 'problem' and ran in the right hand lane after me. It was a great pass, but not quite enough to dip into the magic five-second zone, and it was not without a tremendous amount of skill as he fought to stay on the bike in the (at that time) bumpy shut down area. I had the pleasure of crewing for him along with Dave Schnitz at Gainesville one year, and it was then that his love of ice cream became apparent after my frequent trips to the grocery store to buy what seemed to be gallons of butter pecan. On track in the US he became my nemesis, it is a strange fact that having raced in the US three times, I have so far only lost to a Brit, in my first outing there he beat me in the semi-finals (and took the eventual event win), the second time he whipped me in the first round. At my last successful foray to the US thankfully BJ wasn’t there again. Anyhow, I want to say that despite his sometimes less than endearing manner he was truly special, and although the title is unfortunately misused so often nowadays, he was indeed a true icon of our small but close knit class of Top Fuel Bike racers. My thoughts are with his brother Chris but in the main for the person who shared his drive, and was more than equally responsible for the success in his racing career, Ann. You stay forever in my memory, I remember every moment of more than thirty years with you, for example when we were racing in Gainesville because you told me go to this track to learn a lot. And of course all the information about the Top Fuel Bike, and your support for the Rocket Bike etc. The moment when I came to visit you in your home with Ann, you always told me I was welcome. Thank you Brian for the best moment, to see you run at the Pod . Now I hope you have chosen the star you can look over your home with your telescope and you can see everything where you are. This man helped me so much when I needed advice and parts for my first Pro Stock bike. Such a shock. RIP Brian and Godspeed. Such a sad shock to lose an old friend so suddenly. To me he was always the same old Brian, from when he first started in the sport. Whatever he turned his hand to - he wanted to be the best he possibly could, always supported by his wife Ann. He blazed a trail in drag bike racing on both sides of the pond, and was a well deserving member of the British Drag Racing Hall of Fame. It was Brian who persuaded me to come to Santa Pod again, after a long absence, to see him in his last race there. Thank you for that - it was a real treat for me to see you in action one more time. So hard to believe I will not see your unshaven face again. RIP Brian. Sad to hear the news about Brian, loved watching him race and loved it when he took on the USA and beat them. I had a z9 myself so he was one of my favourites way back, great racer with great bikes. Condolences to Ann and all his family and friends from myself and my brothers Jim and Dave. Very sorry to hear the sad news about Brian, would very often have a chat at meetings when having problems with my bikes, RIP Brian. Remember seeing the 8 second pass in 81. Great run for a great guy. Sad to hear of his death. I was really sad to hear that BJ has passed away. His impact is across several generations of racers and fans and many oceans. His membership of the British Drag Racing Hall of Fame will secure his place in drag racing. My thoughts are with his friends and family. What a loss he was my idol from the late 80s. I learnt a lot from watching him and he always had time for stupid questions. Thoughts are with his family at this time. Very sad news. The word "legend" is sometimes used lightly but BJ defines the word. Looking back, he has been in the motorcycle drag racing books forever. Looking forward, BJ will stay there forever. A true legend of our sport has sadly left us. Godspeed Brian.